Hey there! My name is Eliza, and I’m super glad you’ve stopped by. I have been trying to navigate my way through some of the differences between good quality luggage and good quality hype, so with that in mind I’ve decided to share my thoughts with you in the form of this handy dandy website. If my research has taught me anything, it’s that more times than not, a luggage purchase is a “get what you pay for” scenario. There are a few low cost standouts, but the highest reviews are consistently found in the $200-$300 range. Although, some lines have options at around $120 and they don’t compromise on durability and style. That being said, you may not be looking for a forever set. You may just need a “for now” case or a “for this year” case. You may even need a “for a camping trip I don’t want to go on so I don’t care what happens to the bag because I’m going to abandon it in the woods among the mosquitoes” bag! I don’t specifically know what you’re after, but I can pretty much guarantee you’ll find it here. If you don’t, it may not exist! To get a good idea of what’s out there without going through each page, feel free to take a shortcut. I have compiled an easy to use comparison table that addresses the most basic questions. You can get quick details and then a link to each case once you’re done scrolling through the basic information. You can see the luggage based on a number of different features, but they’ll be separated by type of bag. 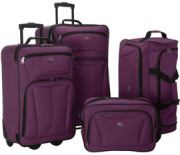 The three categories are suitcases & carryons, luggage sets and duffle bags (for more information on the difference between categories check out my buying guide). The most important question to answer is what you NEED in a bag. If you aren’t sure what’s important to you yet, scroll on over to some of these helpful pages so you can decide for yourself. When you’re looking at exterior quality, these are the two biggest distinctions to try and decide between. I looked at the pros and cons of rigid exteriors and soft options, so you can go through what the differences are ranging from how to save your back the extra strain, and how to protect your belongings. How much a bag weighs when you’re racing across the airport to catch a flight is a big deal for some people (especially me since I’m a pretty small build). For others, the amount of dings and dents a suitcase (or two) can suffer after just a few uses are an even bigger consideration. I looked at both how weight affects the look and how look affects your desire to want to buy the thing at all. You should know whether you’re buying a forever bag or a “for now” bag because if you don’t, you might well be surprised that your bag isn’t going to last beyond a few months. More so, you don’t want to spend a lot of money on a piece of luggage just to find out it’s uncomfortable to use. In this section, I discuss both issues so you don’t end up feeling like you’ve wasted your money. During my luggage “journey”, I have come across a number of options I think really deserve to be on the “front page”! Below, you will find my favorites. This incredible four-wheeled suitcase can spin and spin thanks to its 360-degree swivel wheels. It has great interior storage, a fantastic and reliable locking system, and it’s so lightweight you’ll barely notice you’re carrying it. Even better? It comes in a variety of sizes, colors and designs, and it can also be purchased as a set. My gut feeling is that if people who fly on planes for a living are happy with it, there is some merit to it. Flight attendants and pilots can be seen toting the Travelpro Maxlite around because it’s lightweight AND sturdy, and they’re available in sizes from carry on to 29 inches. This seriously affordable set of cases from Merax costs less than many single suitcases and yet has received incredible consumer ratings. It includes two thick duffel-style bags, has wheels on the main suitcases, expands to fit whatever you need, and each piece can easily be stored inside of another. Consumers report being very satisfied with their purchase and I’m happy to say that you’ll probably feel the same (especially since the entire set costs hardly more than $100). Saying that this is the best luggage you can get out of your dollar, which I really think it is, doesn’t quite cover all of its strong points. Not only is the Samsonite Omni lightweight, but the polycarbonite material used for the body is also super durable and can take quite a beating during your travels. What’s also great is that you can buy a mid-sized and large version of this case, or even purchase it as a three piece set. If you’re prone to sticker shock I’d advise MaxLite’s spinner carry-on, but as far as carry-ons go you can’t really be upset with something from Briggs & Riley. There’s a reason they’ve represented quality luggage for so long. The Transcend Domestic has all the bells and whistles you can expect in modern carry-ons, with sturdiness and durability thrown in for good measure. It may not be the perfect set, but the American Tourister Luggage Fieldbrook II is definitely the best value. The price point is incredibly good, and while there might be some issues with long-term durability, at just about $80 you’re not losing a lot if one of the pieces goes down for the count. It comes in several colors and it has plenty of options for traveling. The Samsonite Silhouette Sphere 2 Deluxe Voyager Spinner Garment Bag looks like it’s straight out of the future. You don’t have to carry it like a standard garment bag, you can just carry it with you, leave the hard work to the spinning wheels and use it as your main suitcase – SOLD! Hardside cases don’t have to be a “drag”. In fact, the Delsey Helium Aero Expandable Luggage Trolley is a hardside case with a lightweight frame and comes with expandable options. It even has the exterior pocket so many people want but can’t find. It gives you all the things that are missing in a lot of hardside cases. This is a tie for two reasons. First of all, I think there are two different kinds of travelers who could be looking for duffles, and I want to give both of you the best option. Second, these two bags are so different I don’t know that they should even be in the same class. 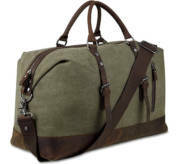 First, the Bluboon Weekender Duffle: This bag is everything that style should be. It’s versatile, beautiful to look at and well-made. The leather and canvas will last a lifetime, and there is little to complain about with the construction. Duffle swoooooon! 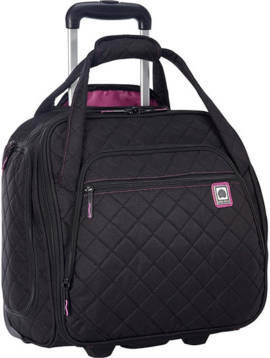 Second is the Delsey Rolling UnderSeat Tote, which does exactly what its name suggests. It’s small enough to keep under your seat, big enough to pack for the weekend, and it’s got wheels your shoulders will love! What’s not to like? Now I know there is a market for some crazy colors and patterns in luggage, I’m keeping my eyes open. The best selection of interesting fabrics is the Rockland 2 Piece Luggage set. There are polka dot designs, animal prints and camouflage to name just a few. If exterior design is your “bag”, this 2 piece is well worth checking out! There are more things to consider if you’re trying to decide what to purchase. Here are some additional issues to wander through so you can make a good decision. Luggage has evolved to the point where two-wheel suitcases seem like old technology. I wanted to know if older meant they are less useful now that there are four and eight wheel spinners on the market. Find out what I discovered on this page. As air travel gets more restrictive, you have to keep in mind that the size of your bag does matter. It could be the difference between storing it in an overhead, paying to check it or even having it refused! Read here to learn how you can size your luggage so you don’t end up in a sticky situation at the airport. If you’re trying to decide if a duffle is going to be substantial enough, I have the answer here. Duffles don’t look like gym bags anymore, but that doesn’t mean you’ll want to take one on a business trip (unless you plan on taking your squash racquet)! In this section, you’ll find information I have found on what the good and the bad is with this type of bag. What’s In a Brand? What You Should Know about Manufacturers. Check here for a rundown on all the different things you should know about luggage manufacturers at a glance. Who makes expensive luggage? Who makes stuff that’s suitable for kids? Everything you need is on this page. After you’re done with everything I’ve put together, I hope you have a better idea of what you want to get and how much you want to spend. I know that I do (now that I’ve gotten it all organized). I’m not an expert in luggage, and I’m certainly not a travel expert, but that’s why I decided to do this. You don’t have to be an expert to buy the right thing for your needs. I hope you enjoy my little creation and that you finally find the right luggage for you.